Hello everybody! 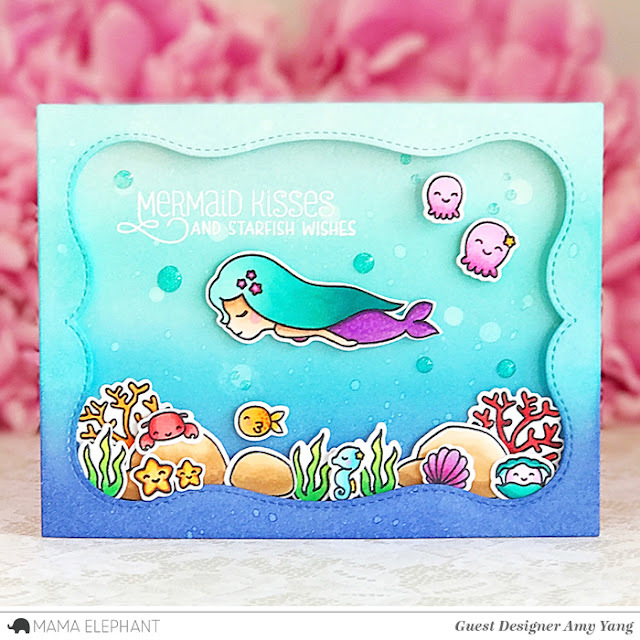 Amy here to share two projects featuring one of my favorites from the summer release, the Mermaid Kisses stamp set for Inspiration Week. 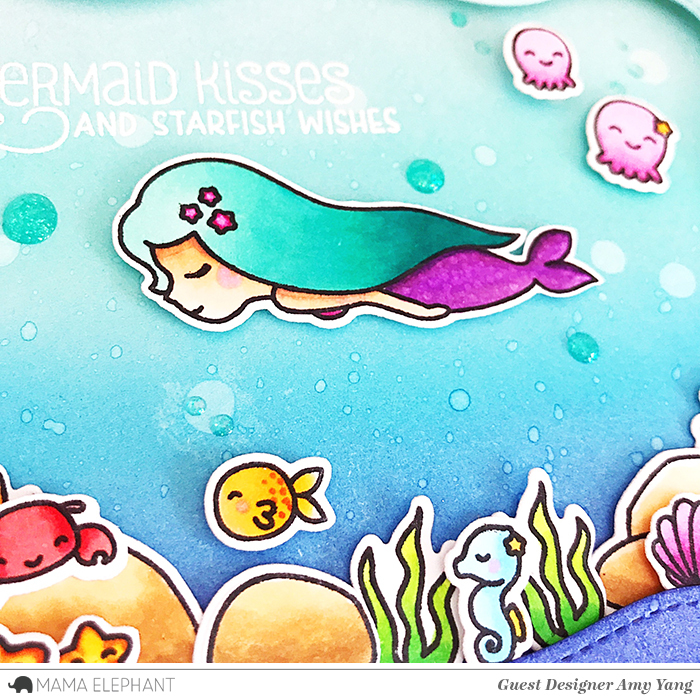 I love this set; the ocean critters are beyond adorable and mermaids are so pretty. It's wonderful for creating underwater scenes. For the first project, I focused on just one mermaid. I love the sweet and serene expression on her face. So, I created a scene where she's peacefully swimming through the water (surrounded by cute critters, of course). To create the card front and the frame, I trimmed two smooth Bristol cardstocks to 4-1/4" x 5-1/2", and die-cut one of them with the frame die from Lafayette Creative-Cuts. I distressed both panels with Distress Inks in Chipped Sapphire, Peacock Feathers, and Tumbled Glass. After, I added splatters of water for a textured look. 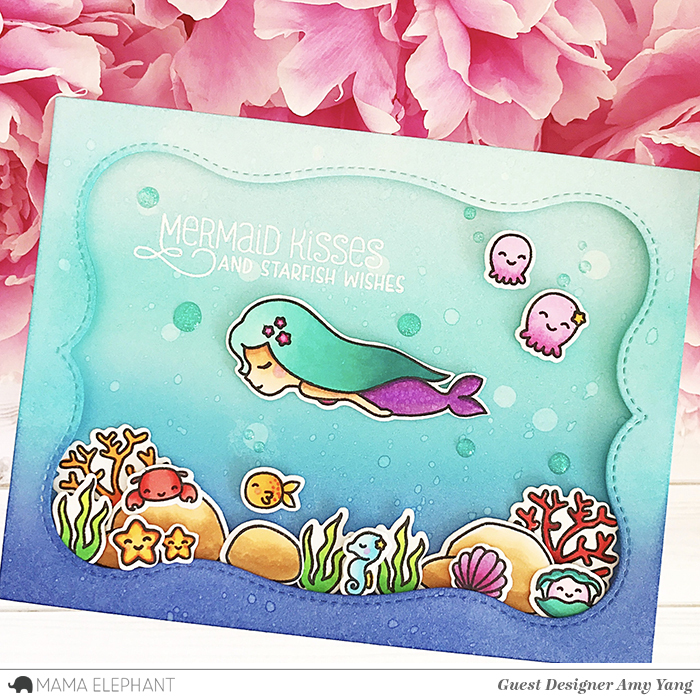 Once the card front dried, I stamped the sentiment, "Mermaid Kisses and Starfish Wishes" with Versamark ink and heat embossed it in white. Then, I mounted the die-cut frame on top with foam tape for added dimension. I stamped the images on smooth white cardstock, colored them with Copic markers, and cut them out with the coordinating creative-cuts. To finish, I adhered the images to the card front, some with double sided tape and others with foam tape. I also added Nuvo drops to add sparkle and more interest to the card. For the second project, I made a shaker card using the Tri -Window Cover Creative Cuts. I love how this creative cut allowed me to create three little scenes on one card. To begin, I stamped the images from Mermaid Kisses on smooth white cardstock, colored them with Copic markers, and cut them out with their coordinating Creative-Cuts. To create the card front and the window frame, I trimmed Bristol cardstock to 4-1/4" x 5-1/2", and die-cut one of them with the frame die from Tri -Window Cover Creative Cuts . I distressed both panels using Dusty Concord, Wilted Violet, Worn Lipstick, and Spun Sugar Distress Inks working from bottom up in that order. Then, I added splatters of water and used a damp (with water) small bristle hair brush to create rays on the card. After, I dipped the brush in Stickles Stardust and created more rays to add shine as well. I was tempted to create a simpler card with this panel because I think it turned out pretty, but I stuck to my plans for making a shaker card. I also added small white Nuvo drops to create bubbles, but it's very hard to see in the pictures. After the two panels were dried, I added some of the colored images to the card front to create dimension. Then, I adhered trimmed acetate to the back of the window frame and mounted it to the card front after adding sparkling clear beads. When you move the beads around, they look like water. It's pretty cool! For the sentiment, I die-cut blue glitter paper using the "HUGS" die from Tri -Window Cover creative cuts. To finish, I created the scenes by adhering the rest of the images to the front windows. Thank you for stopping by. Have an awesome day!